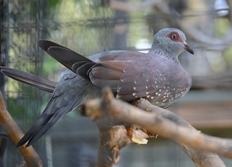 The speckled pigeon is monochromatic with slate grey colored feathers with the primary feathers tinted with chestnut brown and black with a dapple of white. Their eyes are lined with red. Pigeons have small heads and compact bodies. They have very well developed wing muscles and are known to be highly effective during flying. 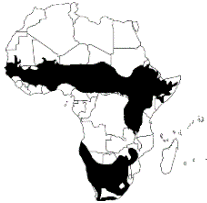 This species is common across most of their distributional range with some flocks that include more than 500 birds. Females lay one to two eggs in a clutch. Their young that are called “squabs” are altricial. Their parents have an unique ability to produce milk from their crops to feed their young. Biparental care is practiced by this species.